In order to explain more about Mother India and the vision behind the documentary, we’ve created a list of Frequently Asked Questions. If you have further questions, feel free to contact us. Why was the Mother India documentary produced? During an initial trip to India in December of 2004, we (Shawn Scheinoha and David Trotter) were immediately drawn in by the striking eyes of unaccompanied children living in urban slums and remote villages. These eyes see and experience a life that is radically different than our own. Since that day, we’ve continued to invest our time and financial resources to give these children a future beyond life on the streets. Now, we want thousands in the US and UK to experience life through their eyes. Where and when was Mother India filmed? Mother India was filmed in the southern Indian town of Tenali (Andhra Pradesh) from December 29, 2011 to January 8, 2012. Is the documentary appropriate for children? Parents should be aware that the film shows the raw reality of living as an abandoned and orphaned child on the streets of India. Interviews include topics of drug abuse, sexuality, violence, and HIV/AIDS, and drug use is explicitly shown. Is the film explicitly Christian? The documentary is accessible to people of all spiritual backgrounds, and the focus is on the stories of the children not on a certain faith tradition. Can my group host a screening of Mother India? Absolutely! We are currently seeking organization, faith communities, and civic groups to host screenings. Find out how to host a screening! What happened to the children featured in Mother India? During the filming of Mother India, a unique opportunity arose that none of us were anticipating. Through a relationship with the leader of the family (Reddy), we were able to arrange a tour of the Harvest India campus and children’s home in Tenali. As you watch the documentary, you’ll discover the complexities involved in helping abandoned and orphaned kids transition into a safe home environment..
Can I adopt children through Harvest India? Unfortunately, adoption by foreigners is extremely difficult in the nation of India. Therefore, Harvest India does not participate in any adoption programs. Instead, their focus is completely on educating and preparing the children to become the leaders of India’s tomorrow. How can I help more people see the documentary? Beyond hosting a screening, the best way is by becoming a film sponsor through a tax-deductible donation. In addition to helping us complete the editing of the film, your financial gift will allow us to enter the film in multiple film festivals and promote the film for possible distribution. Can David Trotter, Shawn Scheinoha, or Suresh Kumar (president of Harvest India) speak at our event? Absolutely. Although Suresh Kumar is generally available only during the summer months, David (based in Orange County, CA) and Shawn (based in Atlanta, GA) are available any time to join you at an upcoming screening or event. To inquire about possible dates, please contact us. How can I help abandoned or orphaned children in India? Although there are many wonderful organizations to partner with, we believe strongly in the successful, long-term work of Harvest India. 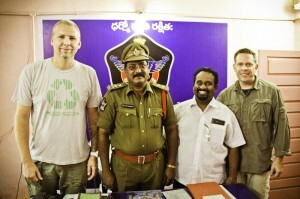 To learn more about their work and how you can make a donation toward orphan care, visit www.harvestindia.org.